Weebly vs Wordpress: Which Web Design Platform is Best For You? Getting your business online can be so dang confusing these days. While web design continues to get simpler and more accessible to the Average Joe, it also means there are more options than ever before. I build websites with both Weebly and WordPress. These days, I use WordPress 90% of the time. But Weebly helped me get to where I am today. Because Weebly meets the needs of the vast majority of small business owners out there. I got a lot of flack from fellow web designers for making this choice. Recently, someone got mad at me online and told me I should be “ashamed of myself” for offering a terrible product “disguised as a professional service“. I love Weebly. You can read my full review of Weebly to find out all the reasons why. In fact, I tell every one of my customers what tools I use to build their website. I’m not hiding anything here. The reasoning these guys used to diss Weebly, and my business as a whole, was flimsy at best. I’m not going to get into all the reasons why these guys hate like this, (I’ll save that for another post) but one common denominator is that they are all WordPress developers. As I said, I’ve use both Weebly and WordPress in my business, and even used WordPress to build this entire blog you’re reading right now. And since I get so many questions about Weebly, and whether it’s worth your time and money, I’m going to use this post to answer as many questions about Weebly vs WordPress as possible. Let’s jump into what will almost certainly become a comments tire fire in the near future. Weebly vs WordPress: Which one is easier to use? Weebly vs WordPress: Which one is cheaper? 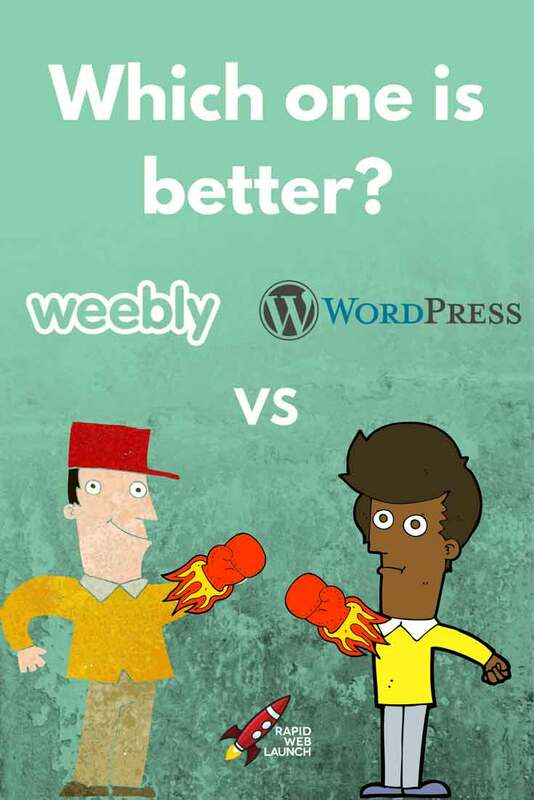 Weebly vs WordPress: Which one is better for blogging? Weebly vs WordPress: Which one is better for SEO? Weebly vs WordPress: Which one has better ecommerce features? Weebly vs WordPress: Which one has better customer support? Weebly vs WordPress: How do I choose the right website builder? Which one is easier to use? In fact, this is Weebly’s biggest selling point. The platform uses a simple drag and drop interface to show you exactly what your website will look like as you build it. Adding text, images, video, charts, backgrounds, and fancy special effects is a breeze. WordPress is infinitely customizable, which also makes it more difficult to use. After the free option, Weebly has multiple pricing plans to suit every budget. They vary based on features, packages and whether you are paying monthly or annually. You get a free domain name included with your website, and all of the themes are free as well. Or you can get real fancy and use some premium 3rd-party Weebly themes. The cheapest option is $8/month, while the priciest is $49/month. Because WordPress is self-hosted, (meaning you need to find your own hosting company to host your site for you) the pricing varies wildly. You will need to buy your own domain and choose your website hosting. I personally use Bluehost. They are one of the most popular WordPress hosting companies in the world, which may be why so many people love to hate on them. I have had nothing but good experiences with them, and their pricing is some of the best in the industry. So I have no problem recommending them. Last time I checked, you can get your WordPress site hosted with Bluehost for as little as $2.49/month. Keep in mind that, when weighing your website hosting pricing options, you need to factor in how much it will cost you to maintain your site as well. Weebly will allow you to easily make your own edits to your website for free, while WordPress will likely require having to pay a web designer to make changes for you. At $30-50/hour, that can add up quick! So, when factoring in ongoing maintenance costs and time required to manage them, Weebly gets the nod for me. Which one is better for blogging? Weebly has a blogging feature, but it’s honestly the weakest aspect of their product. If you just want to write and create content that will help boost your Google rankings, it does the job just fine. If you take blogging seriously, and are particularly interested in monetizing your blog, WordPress is the no-brainer option here. Blogs come in so many shapes and sizes, and WordPress will give you the full customization you need to carve out your own corner of the internet and make it your own. It’s what this and about 90% of blogs are built on. Which one is better for SEO? Ah yes, now this is a controversial one. Mainly because I disagree with most web designers on this one. Don’t listen to the haters. You absolutely can rank your Weebly website high in Google. Read my full guide on how to do Weebly SEO the right way, and see for yourself. I’ve ranked my own website #1 for some pretty competitive keywords. The biggest complaints about Weebly SEO come down to the coding. The coding structure Weebly used to build their platform isn’t the best. It can sometimes make it difficult for Google’s bots to crawl your website, and can reduce your website’s loading speed. However, these issues are blown way out of proportion, and are completely manageable. And for the price you’re paying, Weebly is still a great value. The WordPress platform is built to do very well with SEO. No issues there. But, because it is so customizable, it is very easy to screw up your website and kill your ability to rank well. In the end, you get what you pay for. Sure, you could get a custom-built website with blazingly fast coding made for $5,000 OR, you could make one without all of the bells and whistles for a fraction of the cost. It all comes down to what your goals are for your website. The real foundation of a great SEO strategy comes down to getting high quality backlinks, and you can do that with any platform. Which one is better for an online store and ecommerce? I would put this one in the same column as the SEO question. With Weebly’s recent Weebly 4 update, they took a huge step forward in their ecommerce offerings. It’s never been easier to setup your own online store, add products, accept payments, and coordinate shipping and inventory management. Again, the ease of use is the highlight here. WordPress has some very powerful ecommerce tools and integrations, like Woocommerce. But, (and stop me if I sound like a broken record) you need to know how to use them. I wouldn’t say you need to have advanced web design skills to make it work, but there is definitely a steeper learning curve. It’s not a turnkey option like Weebly is. Which one has better customer service? While I won’t say Weebly’s customer service is anything to write home about, they definitely have more of an offering than WordPress. That’s because Weebly is an actual company with their own customers. WordPress, on the other hand, is an open-source platform. There is no centralized customer service to contact when you need help. So, when you’re in need of assistance, you will need to turn to internet forums or pay a WordPress expert to help you out. Summary: How do I choose between Weebly or WordPress? BOTH Weebly and WordPress have their pros and cons. To choose the right one for you and your business, it comes down to your goals and circumstances. I’ll try to break this down as simply as possible. No. Weebly provides all of the hosting and domain management as part of their monthly subscription service. Is WordPress the best website builder? Best is subjective. WordPress is definitely the most popular website builder in the world. But choosing a website builder really comes down to what your personal needs and goals are. Is Weebly a good blogging platform? Have some questions? Did I miss something? Yell at me in the comments below! Patrick, Great video Weebly vs WordPress. I’m with you bro. Unless you are blogging or need a MAJOR website – Weebly rocks! As far as your SEO comments – I agree 100%. WordPress devotees look at Weebly as the red headed stepchild when in fact is is a wonderful platform that will be more than sufficient for more than 95% of business in my opinion. Nice article! I’ve read before that WordPress is better than Weebly for monetization or affiliate marketing. I’m just not understanding why exactly. When you mentioned customization, what do you mean exactly? The design? Maybe you could clarify that a bit. Either way, I probably won’t switch. I had a self-hosted WordPress website and I spent more time trying to figure out how to customize a theme than actually writing content. Super annoying. Weebly, I Place and image and it comes out exactly how I see it. Thanks!